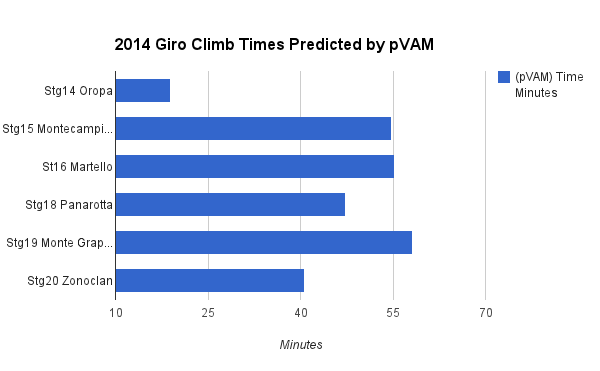 The upcoming 2014 Giro d’Italia features 6 that are likely to play a role in shaping the final podium. 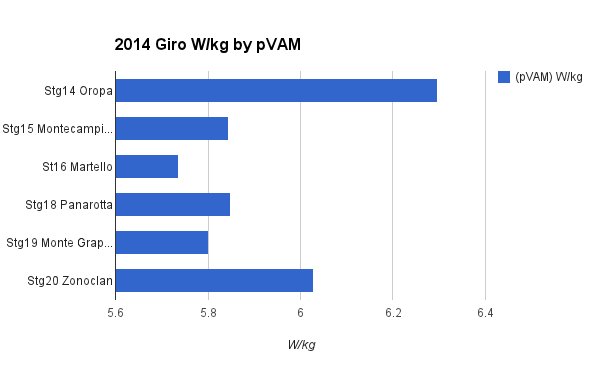 As with previous Grand Tours, @ammattipyoraily is my go to source for the most consistent data. 2. Time the finishing climbs. 3. Estimate normalized W/kg power outputs using the Martin Model. 4. Make sense of the performances with a pVAM and Mean Maximal Power curve. Stage 14 features the Oropa. It is the shortest climb at 6.7 km and the lowest in altitude topping out a little over 1,142 meters with a mid gradient of 8%. Stage 15 brings the Mentecampione. It is also fairly steep at 7.8%, but nearly 3 times longer at 18.7 km. Likewise it tops out in thinner air at 1,665 meters. Stage 16 kicks up the length and altitude with the Martello. The gradient is the shallowest of the major climbs at 6.4% but also the longest at 21.1 km and topping out at 2059 meters. Stage 18 and 19 bring a pair of mid grade/distance climbs. The Panarota is first at 8%, 15.9 km at topping out at 1760 meters, and the Grappa measures in at 8%, 19.3 km, and tops out at 1712 meters. Finally, Stage 20 is the Zonoclan. At 11.9% is is by far the steepest pitch. After 10.1 km riders will top out at 1730 meters of altitude. The simplest analysis of course is simply comparing times to the historical records. 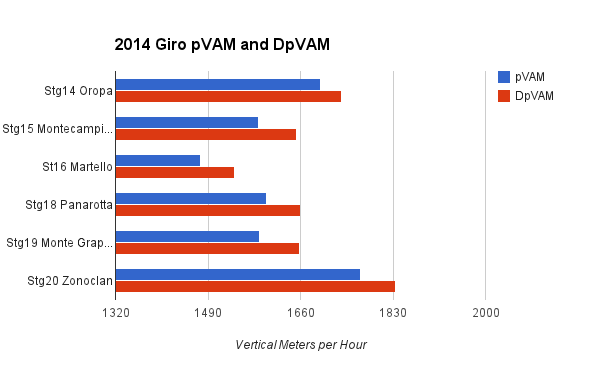 Going a step further, results across different climbs and eras can be compared using pVAM which allows performance predictions based on the characteristics of the climb. For a pVAM analysis, I use equations derived by Scott Richards, who pioneered the method in A Different Approach to Comparing Climbing Performances on Cyclismas.com. The equations uses data from the supposedly clean years of 2008-2013 (pVAM), and at my request, data from the doping years of 2002-2007 (DpVAM), to predict the climbing speeds (VAM) expected from these baselines. Above, are the times predicted by the pVAM equation. Plugging the times into the Martin model gives the power output in normalized W/kg expected for each climb. Not surprisingly, the highest numbers, 6.3 W/kg, will likely come on the short lower altitude Oropa. The lowest numbers, 5.7 W/kg, will likely come from the effort on the long, high altitude Martello. 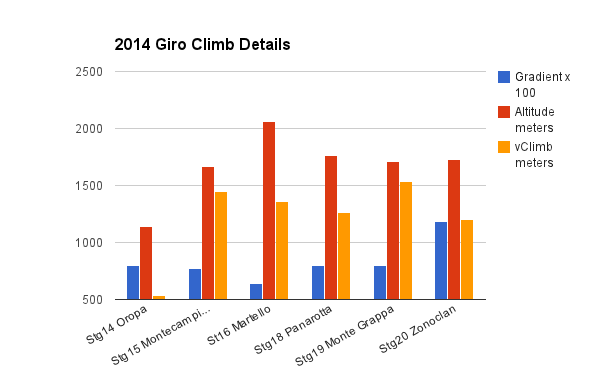 The mid grade length climbs should come in around 5.8 W/kg while the steepness of the Zonoclan should bring out maximal sustainable efforts just above 6 W/kg. Lastly, in case its needed, the DpVAM numbers. The red bars indicate the speeds that would be expected from a doped peleton. As Ross Tucker likes to say, it is probably best to take a step back when looking at the DpVAM. The noise inherent in these methods means that any one performance may not always be interperatable on its own. Do Cyclists Cluster into Phenotypes ?